The popular view of fantasy has, since Tolkien, become dominated by a pseudomediaeval Norse/Teutonic background, as is represented, in various forms, by the works of Lynch, Valente, and Kushner on the World Fantasy Award shortlist. But many other mythologies exist. Those of Greece and Rome are usually explored solely through retellings of the Trojan War or other great mythological narratives (often excising the gods from the tales). But there is much potential in a Graeco-Roman background. As anyone who has read Herodotus will know, to many Greeks, encounters with gods or spirits were simply part of life, as everyday as the weather or other natural phenomena. In 1986, Gene Wolfe, already highly respected for The Book of the New Sun , took time off from the history of Severian to write Soldier of the Mist , the story of Latro, a Latin mercenary in the army of the Persian King Xerxes in 479 BC, and his adventures through Greece in the aftermath of the defeat of the Persian invasion. Latro has suffered a grievous head wound in the climactic battle of Plataea, as a result of divine displeasure. He now cannot recall events of more than a day previously, but on the other hand, he can see the gods and demigods that populate the Greek landscape. John Clute observes in The Encylopedia of Science Fiction that this work picks up and reflects themes in The Book of the New Sun . For me, what Wolfe does is capture the ordinariness of the encounters with deities. The gods want various things done for them, but there are no great epic narratives, no wars of gods and men—just immortals going about their business in much the same way as mortals. Now, seventeen years after the second volume, Soldier of Arete , appeared (the two are now collected as Latro in the Mist ), Wolfe has returned once again to his amnesiac hero. In the intervening period, Latro returned to his Italian home and wife, but his memory is still not restored; so he goes to Egypt in search of a cure. As a result of a series of requests, he ends up traveling on an excursion up the Nile, passing from the heart of Egyptian civilization into the African kingdoms deeper into the continent. Wolfe brings the same everyday approach to the Egyptian deities as he did to the Greek, and is able to explore the way in which the sophisticated deities of Egyptian civilization merge into the more primal deities of the African bush. Wolfe maintains the central conceit of the previous novels, that the text is based upon an ancient scroll written by Latro, as a means of maintaining some record of what he cannot recall. Wolfe is merely the translator—hence the occasional footnote, and in this volume a historical foreword that runs to seven pages, longer than those of the first two put together. At the end of Soldier of Arete , Latro entrusted the scrolls that made up the first two novels to the poet Pindar. Effectively, in doing this he has discarded his own back story. New readers may therefore quite happily start with Soldier of Sidon , knowing no less than Latro himself. The setting is different, there are new Egyptian gods, and the supporting cast is largely new (a slight disappointment for those fond of Pindar and the slave girl Io). There are some references to events of the previous novels, but since Latro himself has no knowledge of those events save what he is told, the reader need not feel that they are missing something that the novel’s protagonist is not. And because everything is new to Latro, and people constantly need to tell him things he has forgotten, he describes everything as if fresh to the readers. Nowhere here is the sort of "As you and I both know, Agathocles ..." infodump. The device of the scroll further means that Latro only narrates what he can recollect on the days when he is able, willing, or remembers to write. This allows Wolfe to make some spectacular jump cuts, throwing the reader into some violent action, the prelude of which may only become clear some chapters later when someone else relates it to Latro. Important plot developments occur off stage, and are only revealed some time after they have happened. It’s a bit like reading a literary version of a Nicholas Roeg movie, and Wolfe can’t be accused of not challenging his readers. But it works, and means the reader never quite knows what is going to come next. They are certainly never bored by overlong transitional scenes. 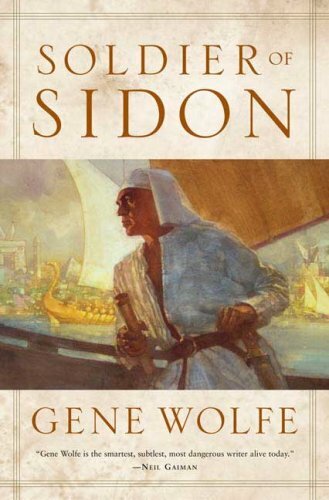 The main reason, however, that Soldier of Sidon works as historical fantasy is that Wolfe knows how to write historical fiction. All his characters, real (and there are fewer of those than in the previous novels) or imaginary, act in plausible ways, and their concerns are, for the most part, those of the time, not those that might interest a twenty-first century reader. (Wolfe slips once on this score, when Latro, watching a bullfight, muses that a purpose-built arena might be better. But he has been so successful elsewhere that we forgive him this.) There is nothing of the flaw of weak writers of historical fiction, to parade their research to prove that they’ve done it. Even the device of translating many place names (though fewer in this novel than before, and only very rarely personal names) into the English equivalent of what Latro thinks they mean (which is not always what they actually do mean), a device I found irritating when I first started reading Soldier of the Mist , becomes something that one just accepts. To this can be added that Latro remains a very likable character. Stripped of his memory, he is also stripped of prejudice and preconception. He takes people as he finds them, and his instincts are usually sound. And his lack of recollection does not make him easily fooled, even if others assume it does. Constantly people try to lead him to taking action that he instinctively knows to be wrong, and will not do. Soldier of Sidon ends with Latro’s story still unresolved. The scroll ends up in a vase that is discovered at the bottom of Lake Nasser. Wolfe gives no indication that there are any further scrolls, but this reviewer at least hopes that one will be discovered in the not-too-distant future. And will Soldier of Sidon win the World Fantasy Award? I can’t judge, not having read any of the others on the shortlist. But it is an engaging yet challenging novel, and recognition would be deserved. One final word: illustrated books are rare these days, but Soldier of Sidon is blessed with delightful pencil sketches by David Grove. Tony Keen reviews for Vector , where an earlier version of this piece first appeared. This was the only nominee I hadn't picked up, and now I think I'm going to have to grab it too. Blast. It's worth pointing out that Valente mines a pretty various set of myths. I wouldn't want to call In the Night Garden overwhelmingly Norse/Teutonic...she seems to be going on a bit of a Myth World Tour. I'm not suggesting that Valente's novel is overwhelmingly Norse/Teutonic, despite the presence of a character called Sigrid. Nor do I want to imply a narrow characterization of Lynch or Kushner's work as pseudo-mediaeval and Tolkienesque - from Victoria and Dan's reviews, that would be even less fair, as both novels choose a post-mediaeval milieu. But these three novels, as far as I can tell (as I say, I haven't read any of them), operate in a tradition that ultimately goes back to the template Tolkien established. Though all three introduce various different spins on that template, often taking it a long way from the original, they are working within a tradition that draws upon the history, culture and attitudes of north-west Europe. I don't regard this as a criticism. But I wanted to make the point that Wolfe's Soldier novels lie wholly outside that tradition. And since it won, you will have to pick it up now!